International criticism of the Spanish government’s behaviour towards Catalonia has so far been muted. However, the central state’s belligerent intransigence has left Catalans with very few choices. Anti-Independence rally against Catalunya Radio September 27, 2017 – Barcelona, Catalonia, Spain. Matthias Oesterle/PA Images. All rights reserved.There are plenty of potential reasons for criticising the current Catalan drive for independence, labelled for want of a better word the Procés, or process. Some of its core supporters seem in a hyper-excited world of their own where the practical issues of forming an independent state are disregarded with happy abandon. Its political drivers are a mixed bag of pro-independence parties with a slim majority of seats in the Catalan Parliament, won with 48% of the popular vote. The bill to authorise a ‘binding’ referendum on independence on the coming 1st October is a mess, passed in an emergency debate playing fast and loose with parliamentary procedures and offering inadequate democratic guarantees. Above all, the independentistes have not engaged nearly enough with the more-or-less half of the Catalan population who are less enthusiastic or actively opposed to independence, particularly in Barcelona and its metropolitan area, and whose involvement would be essential if – and this is a big if – an independent Catalonia were ever to become a functioning society. But. This cannot be stated without also noting the sheer mental poverty of the approach taken on this issue by the Spanish central government and a large part of Spain’s political, intellectual and media establishment. It needs to be pointed out and repeated that the Procés has been overwhelmingly non-violent. The movement has focussed on elections, popular consultation and the right to vote, and has used peaceful means throughout, political campaigning, votes in the Catalan parliament, mass demonstrations in a festive atmosphere, adroit and witty use of social media. There has been no Catalan terrorism (the only such micro-groups disbanded years ago). The Procés has been overwhelmingly non-violent. The movement has focussed on elections, popular consultation and the right to vote, and has used peaceful means throughout. The Madrid government’s response to this campaign in the past week has been to threaten 700 Catalan mayors with arrest should they provide facilities for the referendum, to send police into printing plants to seize voting literature, shut down websites, threaten media outlets if they reproduce referendum-related material and take over the bank accounts of the autonomous Catalan government, the Generalitat. Then on Wednesday 20 September the Guardia Civil launched a coordinated operation – bizarrely named Operación Anubis after the Egyptian God of the Dead – entering Catalan government offices and arresting 14 officials charged with preparing the referendum. Others have been threatened with massive fines. Since then, Barcelona has been filled with permanent demonstrations against the ‘forces of occupation’, with constant cries of votarem (we will vote). The central government’s one and only response to the Catalan movement has been that it is illegal under Spain’s 1978 Constitution, which includes a reference to “the indissoluble union of the Spanish nation”. Any partial referendum on independence by any part of the nation is therefore non-negotiable. So, to prepare any such referendum is also, again, simply illegal, and the state has no option but to suppress it. A police matter. Simple as that. Intellectuals provide op-ed pieces decrying the Catalan Procés in El País elaborating on this line, writing with some solemnity how respect for the rule of law is essential in a modern democracy, and how, since Spain has a body of law in its current constitution, this has to be the yardstick in all things. They condemn the Catalan campaign as an outrage against true democracy, and call on the government to use all “legitimate force” against it (as in the Manifesto signed by a number of academics on Wednesday). This emphasis on ‘pure’ legalism and the strict letter of the law as the sole means of dealing with complex problems would be questionable in any context, but is especially so in Spain. All law is of course open to interpretation, and it is widely recognised that the 1978 constitution is ripe for reform in many areas. The Catalan crisis began in 2006, when then-President of the Generalitat Pasqual Maragall – a socialist committed to developing Catalan institutions within Spain – proposed a reform of Catalonia’s ‘Statute of Autonomy’. This was duly approved by the Catalan parliament, amended but finally approved by the Madrid parliament, approved in an authorised public referendum across Catalonia, and even signed into law by King Juan Carlos. However, the conservative Partido Popular (People’s Party, PP), then in opposition, launched an openly anti-Catalan campaign petitioning for the new statute to be challenged in Spain’s Tribunal Constitucional or Constitutional Court. In 2010, after interminable deliberations, this court declared several articles of the statute unconstitutional. As a supposedly impartial arbiter the legitimacy of the Tribunal Constitucional (TC) was already questionable: its membership had long been subject to political bickering, and some prominent members were closely linked to the PP. Some clauses they objected to also appear in autonomy statutes of other regions that had not been challenged in the TC. So from the first this decision was highly politicised, and to hold up this and other decisions – from which the current crisis has stemmed – as idealised, untouchable expressions of ‘The Law’ is severely disingenuous. To hold up this and other decisions – from which the current crisis has stemmed – as idealised, untouchable expressions of ‘The Law’ is severely disingenuous. The 2010 decision by the TC caused tremendous shock in Catalonia and was the starting point of the Procés. Many Catalans felt that a route to gradual progress open since the 1970s had been slammed shut in their faces. There had always been radical, pro-independence nationalists in Catalonia, with electoral support that varied from around 12 to 2%. Since 2010 support for independence across all available polls has rocketed to 45, 50, even 60%. A still larger number of as much as 80%, including many agnostic on independence, have supported Catalonia’s ‘right to decide’, the demand that it should be able to vote on its own system of government rather than have one imposed from outside. This signals a step-change in public attitudes, which has not been reversed: the tortuous progress of the Procés and its not-quite showdowns has caused attrition, led some people to lose interest and others to become more opposed, but support for full independence is still above 40%, and has never fallen back to pre-2010 levels. You might think that, in a liberal democracy, the fact that 40% of people, in a region which represents a fifth of Spain’s economy, were so alienated from their state – and felt so un-represented by it that they saw no alternative but to leave it – would be seen as a major problem for the whole country, requiring a creative political response from the central government, whether or not you agree with them. None whatsoever has been forthcoming, nor any real recognition that there has been a major shift in Catalan opinion since Mariano Rajoy and the Partido Popular returned to power in Madrid in 2011. Intermittent negotiations between Rajoy and the Generalitat administration – on concrete issues they disputed – broke down, since no change was on offer. Since 2013 the scene has been dominated by the main Catalan parties’ demand for a vote on independence. The Madrid government has given a straight NO in reply, repeating the line that this is constitutionally impossible. Groundhog Day doesn’t quite describe it. This endlessly repeated stand-off over whether it’s even permissible to discuss the idea of independence and a referendum has made the dispute, for Catalanists, one of human rights – of principle. Other, practical issues have receded into the background, with the curious effect of blocking off proper discussion of the potential consequences of independence, which could easily have led to a fall in support for it. Instead, each time, the determination of core independentistes to carry out their vote has become more intense, and the Madrid government’s legal denials more emphatic, leading up to this week. This endlessly repeated stand-off over whether it’s even permissible to discuss the idea of independence has made the dispute, for Catalanists, one of human rights, of principle. A few basic principles: a representative democracy is supposed to rest on a regime of public opinion as expressed in support for different parties in elections. Any individual might not agree with a particular government – if you live in England and don’t like the Tory party – but you have to recognise you live among a lot of people who do vote for them. A different situation arises when one part of a state has a different political culture. Not better or worse, just different. The parties that win majorities in most of Spain, the PP and Socialist PSOE, are minority groups in Catalonia. Catalonia has its own political culture and the parties it mainly elects (even pro-Spanish ones) are different. A similar situation exists in Scotland with the SNP. This means that the central government is, quite naturally, not seen as automatically representative by citizens in the area with a separate political culture, and so – irrespective of the letter of the law – a situation like this demands sensitive handling by the central government. Anyone in Britain is familiar with the idea that the great spark for the modern strength of Scottish nationalism was Margaret Thatcher, who made many Scots feel for the first time that they were being governed as a colony. The actions of the Rajoy government towards Catalonia make Thatcher look a model of inclusivity. The failure of the Rajoy administration and the wider political class to engage with Catalan public opinion in any positive way or offer any political response beyond threats and a Jacobin repetition of the indivisibility of the state is extraordinary. On many occasions, government policy seems to have consisted in nothing more than wasting time, on the assumption that the Catalans lack the resilience for a long haul and would at some point get bored and just give up (an approach summed up in contemptuous references to the Catalan soufflé, which would inevitably deflate). Many in government and outside it refer to the Procés movement as a plan soberanista, a ‘pro-sovereignty plan’, implying it is something of a top-down conspiracy cooked up by devious Catalan politicians, who have lured deluded ordinary citizens astray like so many pied pipers. Some have actually said the masses have been ‘abducted’ by the pro-soberanistas, and only on Thursday, in response to the mass protests, government spokesman Luis Méndez de Vigo said that “normal people” did not take part in such demonstrations, a neat rephrasing of the old ‘silent majority’ trick. In fact, there is ample evidence that the radicalisation of many once very moderate, non-independentist Catalan politicians has been due to the opposite: an inability to resist the frustration from below. These demonstrations have been truly ‘transversal’, attracting all ages, families, minorities, in a giant, party atmosphere – something ‘completely new’, an experienced observer said to me, in the gamut of political campaigning. While failing to offer any positive approaches, the government’s supporters – including many senior figures in the PSOE, especially from its ‘old guard’ – have spent time finding further justification for their moral superiority. As said earlier, the Catalan agitation has been an overwhelmingly peaceful movement. Its foremost expression has been in vast, mass demonstrations – especially on Catalan National Day, 11 September – of over a million people. These demonstrations have been truly ‘transversal’, attracting all ages, families, minorities, in a giant, party atmosphere – something ‘completely new’, an experienced observer said to me, in the gamut of political campaigning. Huge cross-community rallies have sustained the movement’s energy. And they have gone on for several years without a single violent incident. Of all aspects of the Procés this is the one most consistently ignored by the Madrid commentariat. Instead, they have chosen to present this non-violent movement as if it were a violent one, as if this would make the whole thing a lot simpler. Former socialist prime minister Felipe González has compared Catalan proposals to “the German or Italian adventures of the 1930s”, and Esperanza Aguirre, former PP Education Minister, has suggested Catalanists want to treat those who don’t agree with them “like Jews in Nazi Germany”. 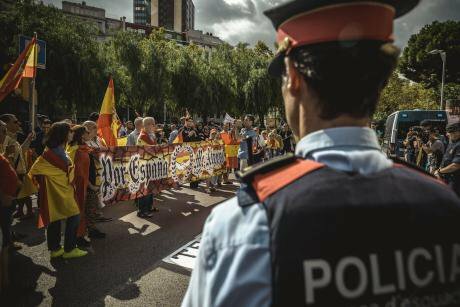 Comparisons of Catalanists to Nazis and accusations that the Procés is a “totalitarian project” began in Spain’s far-right media, but have become mainstream. Catalanists are regularly accused of destroying the convivencia (peaceful coexistence) of all sections of the community in Catalonia, marginalising non-Catalan speakers and discriminating against all who disagree with them in a fascistic manner. Those who do not follow the process, it is claimed, are so intimidated that they cannot speak up. Yes, many Catalanists are convinced of their own certainties and dismissive of opposition. The role of the Spanish and Catalan languages in education has long been a sore point, though the number of Spanish-speaking parents complaining has never been as high as suggested in Madrid. Yes, too, anti-Procés student groups have had posters torn down, some opponents complain of being marginalised at work or insulted in the street, and there’s vicious abuse from both sides on Twitter and other social media, as on every issue in the world. All of which is stupid and unpleasant, but it’s very hard to find incidents of actual violence (if there had been, the Madrid press would surely have shouted it to the rooftops). In New York this week Spain’s Foreign Minister Alfonso Dastis accused Catalanists (or “these people”) of “taking Nazi attitudes” because they had put up posters of mayors who were refusing to cooperate with the referendum, something that is surely within the bounds of political push-and-pull. To compare this with actual, murderous fascism is absurd. One has to wonder where this extraordinary readiness to trivialize references to Nazism and the Holocaust has come from. In most of Europe the shock and images of the Holocaust, the piles of bones, provide a benchmark of evil, an archetype of mass murder, armed gangs burning out houses, smashing windows, people beaten up in the street. To equate this so frivolously with anything now happening in Catalonia is grotesque, and deeply tasteless. One has to wonder where this extraordinary readiness to trivialise references to Nazism and the Holocaust has come from. Yes, again, in their determination to get a referendum pro-independence supporters have often discounted local opposition – the more so as frustration at the closed door has mounted – and fallen into the totally unreal argument that if they win by so much as 50% +1 in a Catalan poll this will be sufficient to create an independent state. But their central demand is still for a fully legitimate referendum – as in Scotland – with all due guarantees, for which all sides could campaign and which they could potentially lose, not, as some allege, a rubber-stamp plebiscite like those of Nazi Germany. This is not fascism, and to claim it to be so is a twisted narrative, a roll-out of lazy stereotypes. And in Spain, abstract reiterations of the indivisible nature of the state, caricaturing the Catalan movement as a top-down ‘plan’, and labelling peaceful demonstrations as Nazism, are all variants of the same thing: excuses for avoiding real issues. They represent a wilful refusal to acknowledge and engage with the deep alienation from the Spanish state among a large section of the Catalan population. Despite all the crudity of their position Rajoy and his supporters have so far enjoyed a pretty easy ride internationally. Terrified of instability, most EU countries have been loath to make any criticism, and the Catalans have been told that, like the Scots, they would have no easy re-entry to the EU if they ever did achieve independence. The Catalan movement has not received much active sympathy, either from progressives or the formal left, perhaps influenced by an easy assumption that minority nationalisms are somehow ‘regressive’, a sideline, disruptive and negative. This is an arbitrary prejudice in itself (no British leftist would ever apply this idea to Irish nationalism). The anti-Catalanist intelligentsia in Spain appeals repeatedly to this attitude, suggesting – in addition to all the Nazi allusions – that they are models of cosmopolitan liberalism, while Catalanism is an atavistic, primitive folk nationalism like the ones that caused the greatest miseries of the twentieth century. A favourite phrase is to call it an excluyente, ‘excluding’ nationalism, intolerant of all those who don’t share its crude vision. As has already been said, this is frankly a feeble, lazy argument: there is no one monolithic model of an intolerant Catalanista, and very many – if not most – supporters of the Procés uphold ideas of ‘civic nationalism’ like those that energised the Scottish referendum campaign, presenting independence as an opportunity for change blocked by the inflexibility of the Spanish state. And, as we all know, it takes two to tango, and there is more than one nationalism in the Iberian peninsula. There is one that has a notable history of belligerence, excluding people and a resort to militaristic imagery and language: Spanish nationalism. As we all know, it takes two to tango, and there is more than one nationalism in the Iberian peninsula. Though this has the characteristics of the ‘banal nationalism’ of an established state (so the esteemed commentators of El País can treat it as no form of nationalism at all, just the norm) Spanish nationalism is also marked by insecurity, a product of Spain’s tortuous modern history. One feature of it is that while modern Spain has little experience of external enemies – and the so-patriotic Rajoy government’s acquiescence to all the austerity demands of the EU Troika contrasts vividly with its belligerence on Catalonia – its nationalism has been directed much more against ‘the enemy within’. Since the late 1990s the PP has been the standard-bearer of a freshly assertive Spanish nationalism and a ‘recentralisation of the state’, and been very happy to appeal to ancient prejudices in doing so. When Rajoy himself launched the petition to challenge the Catalan Statute in the Constitutional Court in 2006, the PP’s canvassers used the slogan “give a signature against Catalonia”. Not the statute, not anything specific, but Catalonia – a phrase surely as ‘excluyente’ as anything in Catalanist literature. In 2012 the Education Minister, José Ignacio Wert, said in parliament that it was necessary to ‘Spanish-ize’ (españolizar) Catalan children. Beyond such eye-catching statements, these attitudes have been expressed practically in dysfunctional relationships at multiple levels between Catalan institutions and the state, such as infrastructure programmes that consistently marginalise Catalan interests. But for the PP, and some of the PSOE, frivolous appeals to anti-Catalan prejudices in their home patches have been easy vote winners, helping them to avoid discussion of more difficult issues – namely austerity – and putting off ad infinitum any more constructive approach to the Catalan situation. The Rajoy government has now introduced the use of force, in a situation previously without violence. This having started, it raises further questions, such as how long it will be kept up, how long those arrested are to be held, what they are to be charged with. The state’s intervention has already extended beyond its initial remit, since meetings due to be held by the radical-left Podemos movement in Madrid and Zaragoza to discuss events in Barcelona have been denied buildings on the grounds that they would aid the preparation of an illegal referendum, an interesting extension of the law for those so keen on constitutional correctness. From any democratic standpoint the intervention has been counter-productive, since the En Comú Podem movement, which heads Barcelona city council under Mayor Ada Colau, and which was previously extremely critical of the referendum, has now formed a common front with the pro-independence parties in condemning the government’s actions. With its combination of neglect, time-wasting and posturing inflexibility the Rajoy government has let this situation fester and done nothing but make it worse. With its combination of neglect, time-wasting and posturing inflexibility the Rajoy government has let this situation fester and done nothing but make it worse, making no positive contribution that’s remotely visible. Now, thanks to ‘Operación Anubis’, it seems impossible that there could be any kind of valid referendum on 1 October, but the ‘arc of protest’ in Catalonia has been re-galvanised – after years in which issues had seemed unclear, and support had been whittled away – with a wave of anger that extends far beyond the numbers of committed independentistes. As a way out, Pedro Sánchez, General Secretary of the PSOE, proposes a recognition of the ‘plurinational’ nature of Spain and a reform of the constitution along fully federal lines, and similar proposals have been made by Podemos. However, the PP is flatly opposed to any such thing, the PSOE could not be relied on to deliver it since many of the party’s senior figures despise Sánchez and are as virulent on the Catalan issue as anyone in the PP, and Podemos seems to have reached its electoral ceiling in the rest of Spain. So no immediate, positive proposals are anywhere in sight. In the meantime, Catalans who already felt their state was inflexible, hostile and blind to their concerns have received fresh graphic evidence on their streets, and may be more inclined to feel that independence, for all its unknowns, is the only way forward. What else are they supposed to think?